Send custom Sound Clips in MSN Messenger and Live Messenger! Sound Clips for MSN Messenger 1.7.0 is chat & instant messaging software developed by Messenger Tools. Sound Clips for MSN Messenger 7.5 and Windows Live Messenger allows you to send audio clips to your contacts instead of recording your own voice, and you don't even need a microphone! You simply choose any audio file and send it to them! The add-on is easy to use and your contacts don't need to have the add-on installed to hear the Custom Sound Clips! Download now, comes with 15 default sounds, and supports any MP3 or Wave (WAV) file. This communications program is freeware, so you can download and use it absolutely free. Sound Clips for MSN Messenger 1.7.0 supports English interface languages and works with Windows 98/XP/Vista. Latest Sound Clips for MSN Messenger 1.7.0 does not contain any spyware and/or advertise modules, allowing installing it with no worries concerning valuable information loss. We has completely tested chat & instant messaging software Sound Clips for MSN Messenger 1.7.0 many times, written and published the interesting article and uploaded installation file (484K) to our fast server. 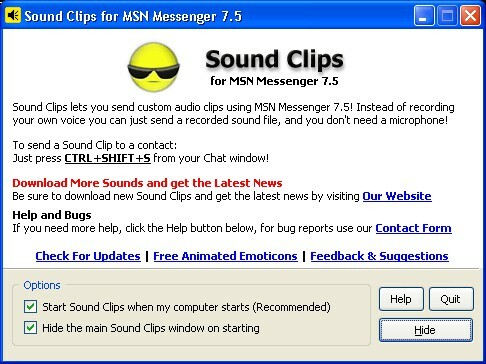 Downloading Sound Clips for MSN Messenger 1.7.0 will take several seconds if you use fast ADSL connection. View the details of all contacts in your Windows Live Messenger.